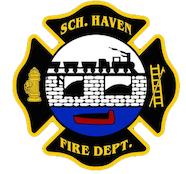 May 28, 2010- At 00:15 Chief 722 (Sattizahn) had stations 1 & 2 dispatched to assist him at 428 Dock Street, Schuylkill Haven Boro, for an odor investigation. Once the incoming units arrived on scene they placed monitors in service to find what and where the odor was coming from. After a couple minutes, Chief Sattizahn asked to have a PPV fan set up to remove the fumes from inside the residence. Time out was 45 minutes. May 27, 2010- At 20:28 stations 1 & 2 were dispatched to the area of 40 East Second Mountain Road, North Manheim Twp, for a tree down on the roadway. Engine 732 arrived on scene to find a small tree. The crew from the engine cut it up and removed it and were clear in under ten minutes. May 27, 2010- As apparatus was responding to the fire alarm at the Water Treatment Plant, a second call came in, sending Engine 732 to 105 Center Ave, Schuylkill Haven Boro, for a motorcycle fire inside a garage. A member from Station 4 who lives in the area made a quick hit on the fire via a water can as units began to arrive on scene. Crews then applied floor dry to the fluids that had leaked out and surrounding the areas. Engine 732 and Chief 723 (Donatti) remained on scene for about 15 minutes. May 27, 2010- At 17:10 the SHFD was dispatched to 16 Tumbling Run Road, North Manheim Twp, for an automatic fire alarm (Sch. Haven Water Treatment Plant). Once units arrived on scene, a search was conducted throughout the building and it was eventually found to be a false activation. May 25, 2010- At 10:59 stations 1 & 2 were dispatched to assist Medic 63-01 at 204 Center Ave, Schuylkill Haven Boro, for a medical assist. Once people started to arrive, they assisted the medics with lifting the patient to the awaiting medic truck. Time out was about 15 minutes. May 21, 2010 – At 01:23 Stations 1 & 2 were dispatched to 522 East Main Street in the borough, to assist with a Cardiac Arrest. Chief 720 (Peel) had command and all units were placed available after a few minutes. May 20, 2010 – At 20:18 Station 2 was dispatched to 1 Orchard Street in Pine Grove (HH&L Fire Company) for a move up assignment as Pine Grove was searching for a reported structure fire. As Engine 733 was en-route they were canceled by SCCC. May 18, 2010 – At 14:44 Stations 1 & 2 were dispatched along with District 41 (Cressona) to the area of 1530 Route 61 South (Cressona Mall Entrance) for a motor vehicle accident with injuries. When Chief 41 (Mansell) arrived on scene he was met with a two vehicle accident with injuries and a large amount of fluids leaking onto the roadway. Crews arrived on scene and applied floor dry to absorb the spill and assisted with traffic control. Chief 720 (Peel) had command and all units remained on scene for just under 1 hour until PSP and the towing company arrived. May 18, 2010 – At 12:57 Station 2 was requested by Chief 722 (Sattizahn) to the area of Manheim Road and East Second Mountain for a fluid leak on the roadway. Crews arrived on scene and applied floor dry and pads down to absorb the spill. Chief 722 had command and units were on scene approximately 15 minutes.